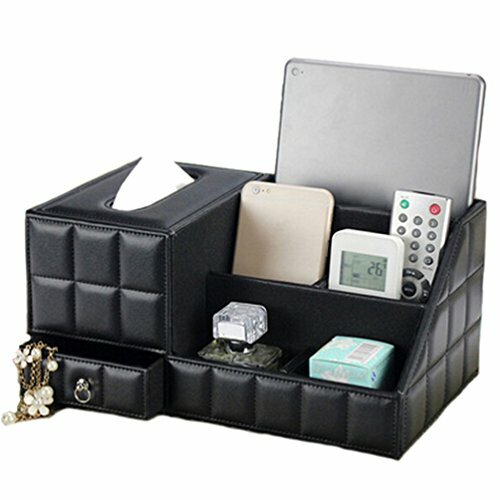 Package List:1 x Black Multifunction Storage holder & Tissue box. *Surface is made of high quality PU leather, interior and bottom are made of soft flannel,environmental-friendly. *Storage holder and Tissue box for remote controls, CD and other things of different size. *This high quality remote control caddy is made of Pu leather/veggie-leather, bringing both function and style to your living room! * Interior and bottom are made of soft flannel,shortage the friction between the box and your items! *Storage holder and Tissue box for your cellphones, remote controls,pens and CD or other things of different size! Dimension: 30.5cm X 18cm X14.5cm(L x W x H). Desktop multifunction organizer. Multi-function ; Choosing it to hold office supplies in workplace or organizing some bedroom clutter on your nightstand. If you have any questions about this product by JHGJ, contact us by completing and submitting the form below. If you are looking for a specif part number, please include it with your message.